Jan van Eyck - The Arnolfini Portrait, 1434 (National Gallery, London). 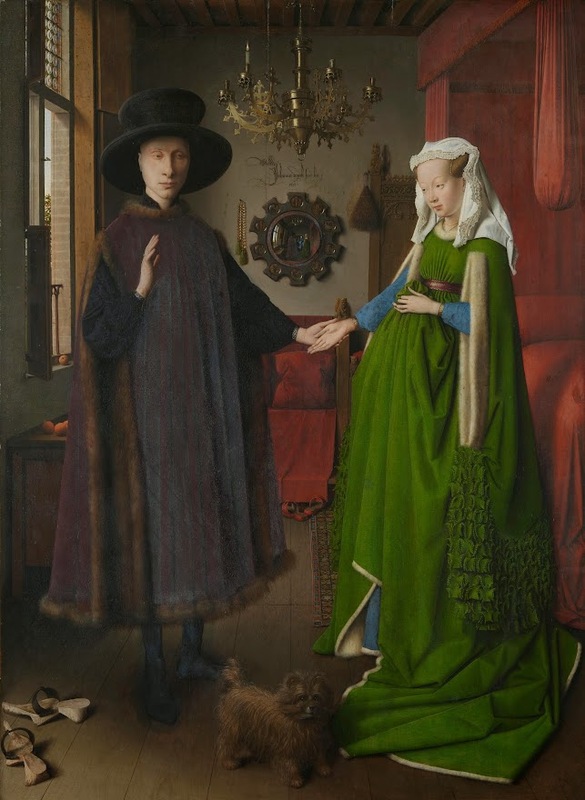 This painting by Jan van Eyck (1390-1441) depicts a wedding contract. The woman is not pregnant, but holding up her full-skirted dress in the contemporary fashion. The ornate Latin signature translates as 'Jan van Eyck was here 1434'. Note the shoes, the dog (symbol of loyalty), the peaches (15th century status symbol), the chandelier and the mirror. What a fascinating picture, thanks for the explanation of the details. The man looks rather solemn and possibly a little sinister. The reflection in the mirror is very interesting.